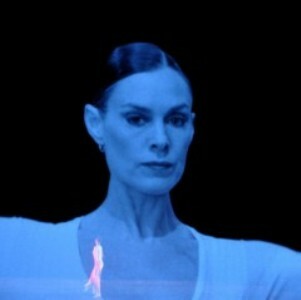 appearing on the screen as the soloist echoes her movements. Editor’s note: The first of these two reviews is by David Moreno, who interviewed Childs prior to her company’s engagement in San Francisco. The second is by Bay Area dance critic Joanna G. Harris. Times have changed. Visual artist Sol LeWitt’s original black and while film has been digitally remastered, as has Phillip Glass’ score. Dancers’ techniques have improved, somewhat due to cross training, which in turn gives them more muscularly defined upper bodies than their 1970’s predecessors. And audiences (thanks to demigods Childs, Glass, and LeWitt) have become more sophisticated. So, perhaps the enthusiastic applause might be even sweeter to “Dance”’s collaborators than it was 30 years ago when audiences had less conceptual art under their belts? What hasn’t changed in this revival of “Dance” is Childs’ choreography, which is just as fresh and energetic as ever. In fact, it can’t be changed because the same choreography is documented in LeWitt’s film, which functions as both set design and at least half of the staging/choreography. The film, which Childs refers to as “decor,” was his first and last, beautifully reflecting the graphic and minimalist signature of his sculptures and works on paper. LeWitt’s film consists of selected passages of the choreography, which are perfectly synchronized with the live dances onstage and projected onto a transparent theatrical scrim. Thanks to the lighting design by Beverly Emmons, the scrim is invisible so that dancers can swirl and jet behind it. Various film clips with different camera angles—closeups, wide shots, split or boxed screen—provide different perspectives and dimension to the repetitive, sometimes pedestrian, and abstract movement and keep the piece interesting. “Dance” is organized into three different movements. “Dance I” and “Dance III” are performed by a group of four men and four women; they are separated by a solo piece, “Dance II,” originally performed by Childs. Each segment runs about 20 minutes long, beginning and ending with a sudden freeze frame image, or a suddenly emptied stage. Manipulations of screen images shift the scale of dancers and sometimes double the number on stage. The performance starts with the score’s hard-hitting first note and ends the same, with the tumbling and invigorating music never letting up throughout. Yet, what none of the creative collaborators of “Dance” could have anticipated was how, over time, this time/space relationship would take on new and more profound meaning, as the dancers in the film would become ghosts from another era. Where originally the dancers were the same in both film and on stage, this production’s dancers on stage are now dancing with their predecessors—with dance history itself—as they take the piece forward into what is now contemporary. Even Childs is among the audience as Caitlan Scranton dances what was once Childs’ solo, while the cinematic Childs dances away three decades earlier on a ghost-like scrim that separates past from present. Take ten well-trained dancers live, juxtapose them with dancers on a 1979 film with the same choreography by Lucinda Childs and the result is “Dance I”/”Dance II”/”Dance III.” The lively movement phrases are repeated over and over—skip, slide, leap, change direction, meet, pass, exit and return. Everyone is dressed in white leotards and pants. What is continually remarkable for the viewer is the development of the choreographic lines and patterns and the visual and rhythmic play between stage and screen. The program is comprised of three dances; each is approximately 20 minutes in length, performed together without an intermission. “Dance II” is a solo for Caitlin Scranton. Unlike the space pattern of Dance I, where the company crosses primarily from stage right and left, this piece grows from upstage center. The dancer, again repeating similar patterns, moves down and up stage, varying with half-circles that spin clockwise and counterclockwise. Then Childs appears on the screen, accompanying, echoing and doubling those patterns. As in the earlier film of “Dance I,” the filmmaker, artist Sol LeWitt, has been able to tilt the dance floor so that its different pitches allow the screen soloist’s body to appear in diverse relationships to gravity and, in off-focus shadow, the dancer’s body is often enlarged. The film comes in and out of play: the stage soloist continues. The viewer must focus, choose and attempt to hold all the possibilities. It’s exciting! “Dance III” continues with eight dancers. The tempo accelerates and now the space patterns include the use of the corners of the stage, with dancers waiting to rejoin the mix. There are additions to the material of “Dance I”: an arabesque hop, a turn in the air, arms reaching diagonally up. “Dance III” is a continual canon and fugue of dance motifs that resound with visual and kinetic exhilaration. It is amazing to watch the sustained energy of the group. Their driving force brings the audience to a breathless ovation. Dancers in the current company include: Katie Dorn, Sharon Milanese, Katherine Fisher, Shakirah Stewart, Anne Lewis, Ty Boomershine, Patrick O’Neill, Vincent McCloskey, Travis Magee and Joshuah Green. Dancers in the 1979 film were: Megan Walker, Susan Osberg, Judy Padow, Cynthia Hedstrom, Lucinda Childs, André Peck, Erin Matthiesse, Graham Conley and Daniel McCusker. Not everyone is thrilled, however, with Phillip Glass’ music. “Dance I” and “Dance III” are performed to a recorded track by the Philip Glass Ensemble; “Dance II” is recorded music by Philip Glass and Michael Riesman. In time, there is acceptance of the repetition and sound level of Glass’ scores, but they are rarely comfortable for full time listening. At best, they provided the steady beat the dancers moved to with such precision. At worst, the sound pounded our eardrums. The excellent lighting was by Beverly Emmons, and original costume design was by A. Christina Giannini. The program was produced by Pomegranate Arts and sponsored in San Francisco by San Francisco Performances. Bay Area audiences will be pleased to know that in 2012 Cal Performances (at Zellerbach Hall on the UC Berkeley campus), will bring “Einstein on the Beach,” an opera by Philip Glass and Robert Wilson. As in early productions, the very accomplished Lucinda Childs will be the choreographer. It is an event much anticipated, as are all works we might be fortunate to see by Childs.